Explore how Mike Bartlett’s future history play echoes Shakespeare in this three-part series. 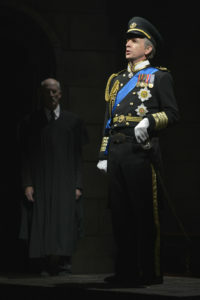 Warren David Keith and Robert Joy in the American Conservatory Theater production of King Charles III, directed by David Muse. Photo by Kevin Berne. The structure of King Charles III was clear to playwright Mike Bartlett from the first moments of inspiration. “The idea for [the play] arrived in my imagination with the form and content very clear, and inextricably linked,” says Bartlett. “The content was an epic royal family drama, dealing with power and the national constitution, and therefore the form had surely to be Shakespearean.” The play would be five acts, just like Shakespeare’s dramas. King Charles III would be the tragic central figure, akin to King Lear or Prince Hamlet. And Bartlett knew that his play would have a comic subplot, similar to the one in Henry IV, probably involving Prince Harry. But even though Bartlett began the project with a strong handle on the structure, it would still be a long time before the play found its place on the page. But finally, Bartlett mentioned his idea to director Rupert Goold, who convinced him to give it a chance to grow. And that meant Bartlett had to find some way to make writing in verse more accessible. He was inspired by the performances of Ken Campbell (1941–2008), an actor who improvised scenes with his theater company in nearly perfect iambic pentameter. Campbell had a theory about how Shakespeare was able to be so prolific. Many playwrights of that era wrote in iambic pentameter because the rhythm made the lines easy for actors to remember. Because the Bard was also an actor, he performed in iambic pentameter all the time. The meter became instinctual to him.